I first would like to welcome and thank both John and Anne Carrigan for agreeing to do this interview, I know that they are both very very busy people. Fez: What is it that you both do for your “day jobs”? John Carrigan: I am a professional Actor and I have been for over 25 years. I am also a martial arts instructor, I have been training for 40 years. Anne Carrigan: My day job is working as a legal secretary for an international law firm in London, England. Fez: What is your connection to Star Trek? and how has it affected your life? JC: I have always been a huge Trek fan and it got me through tough times when I was growing up. To cut a long story short. I met and got to know "Gene Roddenberry" and he directly inspired me to become an Actor. I was chosen for a TV interview about my career and involvement in Star Trek and some people were asked to sit in the background because they looked good in Trek uniform's, I turned around and looked at one of them never dreaming that she would one day become my wife. "Annie" So Star Trek has had and continues to have a huge effect on my life (especially now that I am in Phase II). AC: I have always had a love of science fiction from an early age: "The Day the Earth Stood Still" is one of my favourite movies and I remember watching it way back when as a teenager and it having a real influence on me. I met John through Star Trek ... he was being interviewed for a Star Trek 30th Anniversary TV programme back in 1996 which was being filmed in "Pages Bar" in London (which was a meeting place for all science fiction enthusiasts in the area at the time). A few of us had been asked to come along to fill in the background for the programme and I happened to be sitting on the table directly behind where John was being interviewed. We haven't looked back since! Fez: How did you first hear of Star Trek: New Voyages/Phase 2? JC: My friend "Doug Drexler" contacted me and told me about these incredible sets this guy had created, so I had a look on the net. Doug later suggested me to James to play "Kargh" and the rest is History. AC: Through a friend of ours, Doug Drexler. Doug emailed John back in March 2004 saying that he had a friend that was filming Star Trek and Doug had mentioned that John would be great for the part of the main Klingon. We just so happened to be out in LA in March/April 2004 and we met up with James Cawley, Jack Marshall and a few others and the rest is history. Fez: Have you worked on an episode, and if so... what episode and what have you done there...? JC: YES, I have played Kargh in "In Harms Way" "To Serve All My Days" "No Win Scenario" "Blood And Fire" "Kitumba" and "Mind-sifter" I also had a small cameo and doubled George Takei in "World Enough And Time"
AC: I have worked on To Serve all my Days (TSAMD), No Win Scenario (NWS), Blood & Fire (B&F), Kitumba and Mindsifter. I was originally asked to join the crew to assist James in the wardrobe/costume department for TSAMD as he was rather stretched on "In Harm's Way" as I am a little handy with a needle. During the shoot of TSAMD the aim was to also shoot 5 small vignettes (sadly only 3 were actually shot), one of which was to be NWS. The month prior to the TSAMD shoot we had met up with a few of the NV crew at the Las Vegas convention and Erik Korngold, one of the writers of the vignettes was there. Having met me Erik asked John if I would be up for the part of a female Klingon officer and if so, he would re-write the vignette for a female Klingon (as it had already been written for a male) AND Le'ak was born. Apart from bringing Le'ak to the screen on NWS, B&F, Kitumba and Mindsifter I had a very small cameo as the femal Andorian Ambassador on TSAMD due to the fact that Hurricane Katrina had hit down South and somebody was unable to make the shoot! Having Kevin Haney work on me was an absolute blast - what a maestro he is! His Star Wars sound impressions are great too! I have also become a bit of an expert when it comes to Klingon costuming .... The Kibumba shoot required a huge Klingon wardrobe and I made quite a few of the classic vests and pants back in the UK before we flew out as I knew there would be no time once we arrived in Upstate New York. Fez: What is your favorite memory of being on set? JC: I have so many, but on my first ever episode I was about to beam onto the Enterprise and I looked over and saw "Eugene Roddenberry" (Rod) smiling at me, then all the memories of meeting his Dad and being on the Star Trek sets with Gene suddenly came flooding back and it dawned on me, how far I had come in my career, all because of Gene and now I had actually wound up on Star Trek with his Son. I almost could not finish the scene. AC: Favourite memory, now let me see, I don't just have the one .... Being made up as an Andorian and seeing the look of surprise on peoples faces when they realised it was me (I was only given 5 minutes notice before getting in the makeup chair) .... The campfires at Sam's cabins with Sarge, Ralph, Ron and all the boys on the TSAMD shoot .... Seeing Walter Koenig come out of wardrobe and make-up dressed once again as Chekov ... Cooking breakfast with Pearl Marshall on a Sunday morning for the cast and crew who were staying at Sam's cabins .... Coming round the corner at Fort Ti on the Kitumba shoot and seeing it turned into a Klingon Garrison - now that really was a spine tingling moment. Oh and Paul Sieber's meatballs of course .... Not all technically on set but still my favourite memories - that's what keeps me coming back! I have also donned a little red dress for B&F, Kitumba and Mindsifter and in fact at one point I am looking at myself on the view screen on B&F - how cool is that! JC: I have worked on many film and TV sets in the past, but I have never worked on a set where everyone was so giving and full of friendship and support, also the love for what we are all doing just radiates the set. I suppose I feel as any Star Trek fan would feel. I had made my own captain's chair when I was young and my room was a shrine to Star Trek and just standing on those sets felt like really being on the Enterprise after I had done it a million times in my mind and my dreams, but because of my involvement with Gene in real life, it was even more special, if that were possible. AC: The atmosphere on set can be fraught sometimes due to time pressures ... but most of the time it's great! Everybody is on the same page and the crew really pull together. My hat goes off to each and everyone of them. I can't say it was a realisation of a dream for me - for John definitely yes! I came on board to help James out in wardrobe/costuming (which I still do when on set) and the fact that Le'ak was written for me still amazes me! I love playing her and now it is like putting on a comfortable pair of your favourite shoes - when that wig goes on I AM Le'ak! Fez: I have heard that you both presented James Cawley with a gift this year for his birthday, what was it? And how were you able to get it together. 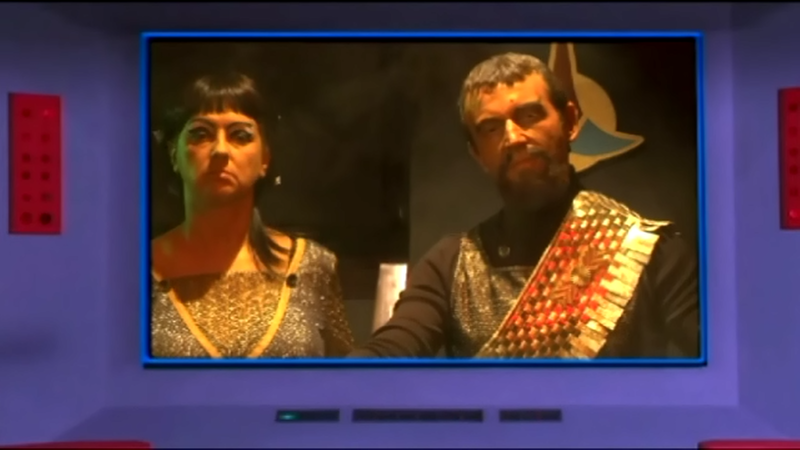 AC: You of course refer to No Win Scenario, the Klingon vignette which was filmed back in September 2005 during the TSAMD shoot. I'll leave John to fill you in on all of that. Needless to say we persevered and succeeded due to John's determination to see it finished for all who worked on it back in 2005 and 2007 and of course the superb assistance of Graham O'Hare and Pony Horton. We were really pleased that James liked it! JC: We presented James with the finished version of the lost Klingon Vignette "No Win Scenario" It would take pages to tell you the whole story of how we got it together. Let's just say that it took something Kirk said in Trek III "The answer is no, I am therefore going to do it anyway" It took determination, planning, semi secret re shoots, tracking down the original footage, Money, months of editing in the UK, months of getting amazing CGI created, months of post production which turned into years and loads of nerves hoping everyone would think all our hard work was worth it. Fez: Any other thoughts you'd like to share with our readers? JC: Only that Star Trek Phase 2 has given me so many friends and opportunities over the past seven years, that it is hard to remember a time before I became involved with my Phase 2 family across the World, I hope I get to play Kargh for another seven. Thank you all.